Previously it was believed that houseleek grown on the roof can protect against thunder, lightning and flames .. But today we know that is the protector and effective natural remedy especially for our skin, like aloe ..
Houseleek roof got his nickname because of its ability to grow on very steep and uninhabitable for other plant substrates. Previously deliberately planted on rooftops or outdoor cellars managed in small time cover brambles. It was believed that houseleek can protect the house against thunder, lightning and fire. Houseleek is a plant that can withstand both cold and long periods without moisture, is very durable and even with significant changes in weather remains green and very decorative. Today it is a popular plant, planted mainly on the rocks, in Europe it in nature as we are not in the Alps or on the rocks of the coastal areas. The easiest way is through reproduction houseleek offshoot, the parent plant casts each year the young shoots that just separated and transplanted to the chosen location or in a pot. The interesting thing is that it takes several years to bloom houseleek, dies after flowering but a parent plant. We can grow inside the room is neither watering needs only enough light to prosper. Houseleek in the room behind the window is not only a home decoration, it is also a natural pharmacy and a small first aid especially for skin problems. 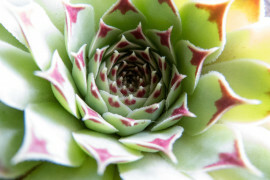 Houseleek has very similar effects on our skin, like aloe . It is considered one of the safest natural cures for skin with almost no side effects. Used lengthwise slit his hands that we can attach directly to the inside surface of the affected parts, or just apply the juice and gel-like fluid from inside the leaf. Houseleek can heal really quite a wide range of skin ailments. Its juice is cool and contains many nutrients, has antiseptic and anti-inflammatory effect. Like aloe, and houseleek is a great first aid and accelerating treatment for burns, opařeninách, frostbite and sunburn. Relieves insect bites, relieves itching, redness and swelling. We can also use it on minor skin injuries, scratches and abrasions, accelerates healing and reduces inflammation. Juice and leaves of houseleek previously commonly used for the treatment and vředovitých inflammatory skin diseases, even for the treatment of ocular inflammation in the eye directly dripping juice from leaves. The juice can also be applied to soften hard skin eg on the feet or on the hydration too dry and stressed skin, hands and elbows. Internally houseleek previously enjoyed in the form of infusion or diluted juice from the leaves as a drink or gargle, especially for sore throat, inflammation of the mouth and bronchitis. Folk healers also prescribe it for diarrhea or expel intestinal parasites. From internal use but over time more or less abandoned, but there are homeopathic remedies made ​​from the extract, which are prescribed to women with menstrual problems. Interestingly, the juice houseleek retains its medicinal properties even after freezing and subsequent thawing, which is quite logical, because the plant itself as well even though severe frost. For us, this means, however, that the juice or whole leaves houseleek can freeze into inventory and use when needed.